This image from NASA's Curiosity rover shows the first sample of powdered rock extracted by the rover's drill. The image was obtained by Curiosity's Mast Camera on Feb. 20, or Sol 193, Curiosity's 193rd Martian day of operations. This story was updated at 3:00 p.m. EST. It's official: Primitive life could have lived on ancient Mars, NASA says. A sample of Mars drilled from a rock by NASA's Curiosity rover and then studied by onboard instruments "shows ancient Mars could have supported living microbes," NASA officials announced today (March 12) in a statement and press conference. The discovery comes just seven months after Curiosity landed on Mars to spend at least two years determining if the planet could ever have hosted primitive life. To be clear, the new find is not evidence that Martian life has ever actually existed; Curiosity carries no life-detection instruments among its scientific gear. Curiosity drilled into a rock on Feb. 8, boring 2.5 inches (6.4 centimeters) into an outcrop called John Klein using its arm-mounted hammering drill — deeper than any robot had ever dug into the Red Planet before. Two weeks later, the rover transferred the resulting gray powder sample into two onboard instruments called Chemistry and Mineralogy (CheMin) and Sample Analysis at Mars, or SAM. CheMin and SAM identified some of the key chemical ingredients for life in this dust, including sulfur, nitrogen, hydrogen, oxygen, phosphorus and carbon, researchers said. Intriguingly, the mix also suggested a possible energy source for indigenous Martian life, if any ever existed in the area. "The range of chemical ingredients we have identified in the sample is impressive, and it suggests pairings such as sulfates and sulfides that indicate a possible chemical energy source for micro-organisms," Paul Mahaffy, SAM principal investigator at NASA's Goddard Space Flight Center in Greenbelt, Md., said in a statement. The fine-grained John Klein rock also contains clay minerals, suggesting a long-ago aqueous environment — perhaps a lake — that was neutral and not too salty, researchers said. "We have found a habitable environment that is so benign and supportive of life that probably — if this water was around and you had been on the planet, you would have been able to drink it," said Curiosity chief scientist John Grotzinger, of Caltech in Pasadena. This set of images shows the results from the rock abrasion tool from NASA's Mars Exploration Rover Opportunity (left) and the drill from NASA's Curiosity rover (right). Note how the rock grindings from Opportunity are brownish red, indicating the presence of hematite, a strongly oxidized iron-bearing mineral. Image released March 12, 2013. SAM is also capable of detecting organic chemicals, the carbon-containing building blocks of life as we know it. The instrument detected two simple chlorinated organics at John Klein, chloromethane and dichloromethane, just it did in a scoop of soil late last year at a different site called Rocknest. Mahaffy urged caution in interpreting the recent find, as the John Klein sample was the first one to go through Curiosity's drill. "There's always the possibility that some residual carbon that was on the drill bit made its way into the sample," he said. "So we're really looking forward to repeating this experiment and seeing if these signatures of simple chloromethane compounds persist." The next drilling opportunity won't come until May, researchers said, since the relative positions of Earth and Mars will make communicating with Curiosity difficult for most of April. Curiosity still hasn't found any complex organic compounds — things like amino acids, the building blocks of proteins. That's not necessarily a surprise, researchers said, since such long, complicated molecules tend to be degraded over time, making their detection a challenge, even here on Earth. Even if complex organics are absent at John Klein, the site could still have supported life, researchers said. SAM detected carbon dioxide in the drilled sample, showing that the area had a carbon source for putative microbes to tap into. Carbon "can be inorganic to be utilized by a microbe," Grotzinger said, pointing out that many micro-organisms on Earth feed on rocks and use carbon dioxide to generate the organics they incorporate into their cellular machinery. Still, the rover team will continue searching for spots with a unique set of characteristics — including protection against Mars' relatively high levels of radiation — that could allow organics to be preserved for billions of years. "That could take the entire length of this mission, but we're going to give it our best," Grotzinger said. This false-color map shows the area within Gale Crater on Mars, where NASA's Curiosity rover landed on Aug. 5, 2012 PDT (Aug. 6, 2012 EDT) and the location where Curiosity collected its first drilled sample at the "John Klein" rock. Image released March 12, 2013. 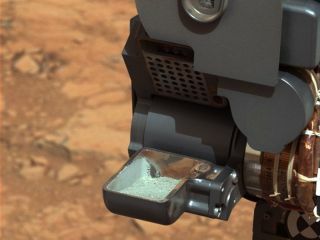 Analysis of the drilled sample was complicated by a computer glitch that's still affecting Curiosity today. In late February, Curiosity's handlers determined that a glitch had affected the flash memory on the rover's main, or A-side, computer system. So they swapped the rover over to its backup (B-side) computer, which caused the robot to go into a protective "safe mode" on Feb. 28. Curiosity emerged from this safe mode on March 2, only to be put on standby briefly once again a few days later to wait out a Mars-bound solar eruption. Full science operations have yet to resume, but Curiosity's B-side computer is working well as engineers continue to work through the mysterious problem with the A-side, team members said. "These tests have provided us with a great deal of information about the rover's A-side memory," Jim Erickson, Curiosity deputy project manager at NASA's Jet Propulsion Laboratory in Pasadena, said in a statement. "We have been able to store new data in many of the memory locations previously affected and believe more runs will demonstrate more memory is available." Engineers plan to upload two software patches later this week, then reassess when full mission operations can resume, officials said. Curiosity landed inside Mars' huge Gale Crater on Aug. 5, kicking off a two-year prime surface mission to determine if the Red Planet has ever been able to support microbial life. CheMin and SAM are two of the 10 instruments it carries to aid this quest. While Curiosity has already made a number of interesting discoveries near its landing site — including an ancient streambed where water likely flowed continuously for thousands of years — its main destination is a set of interesting deposits at the base of Mount Sharp, which rises 3 miles (5 kilometers) from Gale's Center.